February 5, 2019, at hospital, beloved wife of the late David (Davy) and dearly-loved mum of Stephen and Arlene. Service in Newtownbreda Baptist Church, 43 Newtownbreda Road, Belfast BT8 7BQ on Monday 11th February at 9.30 a.m., and afterwards to Roselawn Crematorium for a private family cremation. Family flowers only please. 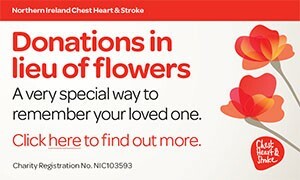 Donations in lieu, may be sent if desired, to Chest, Heart & Stroke, 21 Dublin Road, Belfast BT2 7HB. Lovingly remembered by all the family circle. Deeply regretted by the Henry and Martin family. Dearly loved friend of the late Vera Martin, husband Jack and children Stephen, Elizabeth, Carolyn, Linda, David, Bill, John and Nicki. I am sorry to tell you that Anna Lowry (Laurel) MILLAR has passed away.